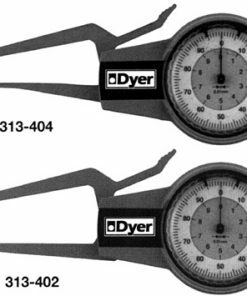 Dyer Company is recognized as a technical leader in a wide range of special application gages, min-wall gages, ID/OD Groove gages, precision bore gages, and more. They have been in the business for more than 40 years and have supplied the highest quality gages that eliminate operator error and cut down measuring times. What’s more, they are also a skilled manufacturer of unique hand and table top gages. All in all, you can expect their products to give you fast, accurate, and repeatable readings and results. If you are looking for high quality and durable Dyer measurement tools, look no further than Willrich Precision Instrument. Willrich Precision Instrument has been in the measurement instrumentation business for many years. As a market leader, we have been working with many top brands in the metrology, inspection and gaging industry to provide exceptional measurement solutions. Regardless of which Dyer product you are looking for, you will love the fact that we have streamlined the product search and purchase process for greater convenience. If you require further assistance with selecting which Dyer product you need, do not hesitate to email us at sales@willrich.com or call us at 866-945-5742 to speak to our knowledgeable sales staff. A warm and friendly hello awaits you.